I have an addiction and I need help. Instead of shooting black tar heroin, smoking crack or popping painkillers, I buy bobbleheads. Sick, I know. My addiction has cost me thousands of dollars and countless amounts of laughs behind my back. Here is my newest "doll". 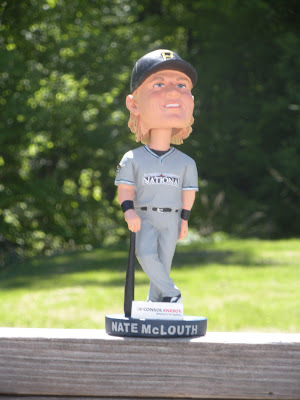 Doesn't it look more like Khalil Greene than Nate McLouth? I've been searching the interwebs looking for a bobblehead addiction hotline or something but no luck. I might have to do this cold turkey. In just 3 weeks it's Honus Wagner figurine night. Wooo. How much is it to switch to heroin?